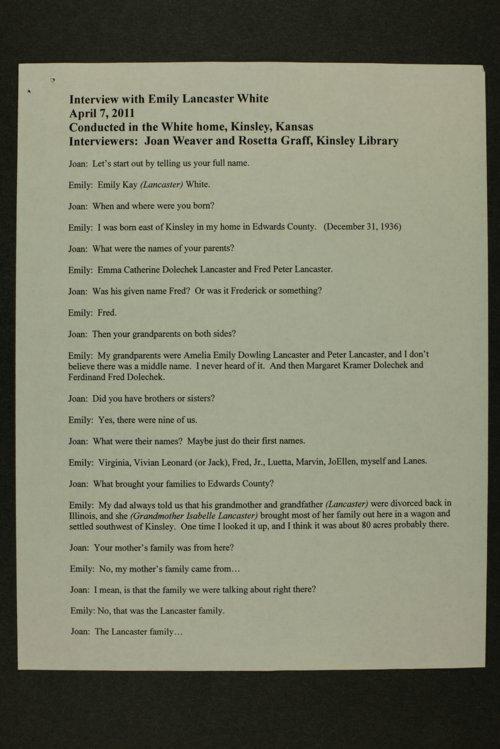 This transcript of an interview with Emily White is part of an oral history project entitled "Patterns of Change, Edwards County, Kansas 1950-1970" conducted by the Kinsley Public Library. The project was supported by a Kansas Humanities Council Heritage Grant. White talks of her family, education, and her memories of the Edwards County community. The interviewers were Joan Weaver and Rosetta Graff of the Kinsley Public Library.